Shop Retail therapy with a purpose. 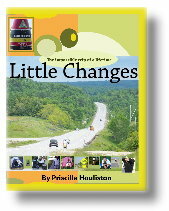 Little Changes is a story beyond belief. With virtually no money, no plans and no experience, Priscilla spent six and a half months living on a bicycle while covering over 3,000 miles on the east coast of America with just her husband. The struggles, hardships, accidents and never-before told close calls melt away as Priscilla shares the secrets of life, weight loss and wrestling a constant battle with homesickness, exhaustion and hunger with the reader. New photographs, shown for the first time give graphic view to just what a body going from 440 pounds to normal looks like. Revealing her worst fears Priscilla has found the path to her best dreams, sharing her story and motivation to the world. There is hope for everyone, regardless of shape, age or health.